Difficulties and sufferings of those faithful in irregular marriage situations merit special attention. Pastors are called to help them experience the charity of Christ and the maternal closeness of the Church, receiving them with love, exhorting them to trust in God's mercy and suggesting, with prudence and respect, concrete ways of conversion and sharing in the life of the community of the Church. Aware however that authentic understanding and genuine mercy are never separated from the truth, pastors have the duty to remind these faithful of the Church's doctrine concerning the celebration of the sacraments, in particular, the reception of the Holy Communion. In recent years, in various regions, different pastoral solutions in this area have been suggested according to which, to be sure, a general admission of divorced and remarried to Eucharistic communion would not be possible, but the divorced and remarried members of the faithful could approach Holy Communion in specific cases when they consider themselves authorised according to a judgement of conscience to do so. This would be the case, for example, when they had been abandoned completely unjustly, although they sincerely tried to save the previous marriage, or when they are convinced of the nullity of their previous marriage, although unable to demonstrate it in the external forum or when they have gone through a long period of reflexion and penance, or also when for morally valid reasons they cannot satisfy the obligation to separate. In some places, it has also been proposed that in order objectively to examine their actual situation, the divorced and remarried would have to consult a prudent and expert priest. This priest, however, would have to respect their eventual decision to approach Holy Communion, without this implying an official authorisation. In fidelity to the words of Jesus Christ, the Church affirms that a new union cannot be recognised as valid if the preceding marriage was valid. If the divorced are remarried civilly, they find themselves in a situation that objectively contravenes God's law. Consequently, they cannot receive Holy Communion as long as this situation persists. This norm is not at all a punishment or a discrimination against the divorced and remarried, but rather expresses an objective situation that of itself renders impossible the reception of Holy Communion: "They are unable to be admitted thereto from the fact that their state and condition of life objectively contradict that union of love between Christ and his Church which is signified and effected by the Eucharist. Besides this, there is another special pastoral reason: if these people were admitted to the Eucharist, the faithful would be led into error and confusion regarding the Church's teaching about the indissolubility of marriage". The faithful who persist in such a situation may receive Holy Communion only after obtaining sacramental absolution, which may be given only "to those who, repenting of having broken the sign of the Covenant and of fidelity to Christ, are sincerely ready to undertake a way of life that is no longer in contradiction to the indissolubility of marriage. This means, in practice, that when for serious reasons, for example, for the children's upbringing, a man and a woman cannot satisfy the obligation to separate, they 'take on themselves the duty to live in complete continence, that is, by abstinence from the acts proper to married couples'". In such a case they may receive Holy Communion as long as they respect the obligation to avoid giving scandal. This does not mean that the Church does not take to heart the situation of these faithful, who moreover are not excluded from ecclesial communion. She is concerned to accompany them pastorally and invite them to share in the life of the Church in the measure that is compatible with the dispositions of divine law, from which the Church has no power to dispense. On the other hand, it is necessary to instruct these faithful so that they do not think their participation in the life of the Church is reduced exclusively to the question of the reception of the Eucharist. The faithful are to be helped to deepen their understanding of the value of sharing in the sacrifice of Christ in the Mass, of spiritual communion, of prayer, of meditation on the Word of God, and of works of charity and justice. 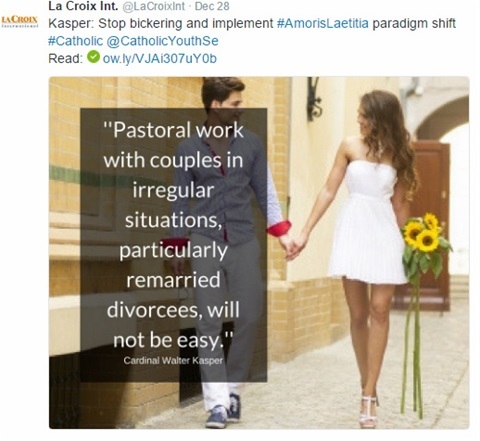 Lifestyles contradicting the union of love between Christ and his Church, signified and effected by the Eucharist, are not in accord with the Catholic faith. This refers to irregular marriage that objectively contravene God's law. Those individuals must abstain from receiving communion until they repent and seek to be faithul to Christ above all else.